Eileen Krenner began her career in Family Law in 2001 while working as a filing clerk in Ramsey County Family Court Administration. Working in Court Administration provided her a knowledge base of court resources and an understanding of the rules and requirements for filing as well as court procedures. While clerking for the child support magistrates and Referee Beddow in Ramsey County Family Court she obtained extensive opportunities to observe multiple hearings and a variety of case types and fact patterns. While employed as an Assistant County Attorney for the Ramsey County Attorney's office she obtained first-hand experience working on cases while the new child support laws were enacted in 2007. Through this experience she worked on complex child support case as well as appeared in hundreds of hearings in both district court and the expedited process. After working with a well reputed family law attorney for several years, Eileen opened her own practice, Krenner Law. In private practice she has represented clients in mediation, early neutral evaluations, and litigation actions to modify their divorce decree and other complex arrears of family both financial and social. 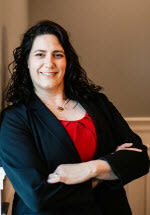 She has experience working with a variety of different cases and clients from all walks of life.